James Loader is a much renovated and altered wooden BCN tug, built by Joe Worsey of Walsall for Leonard Leigh Limited in 1946. 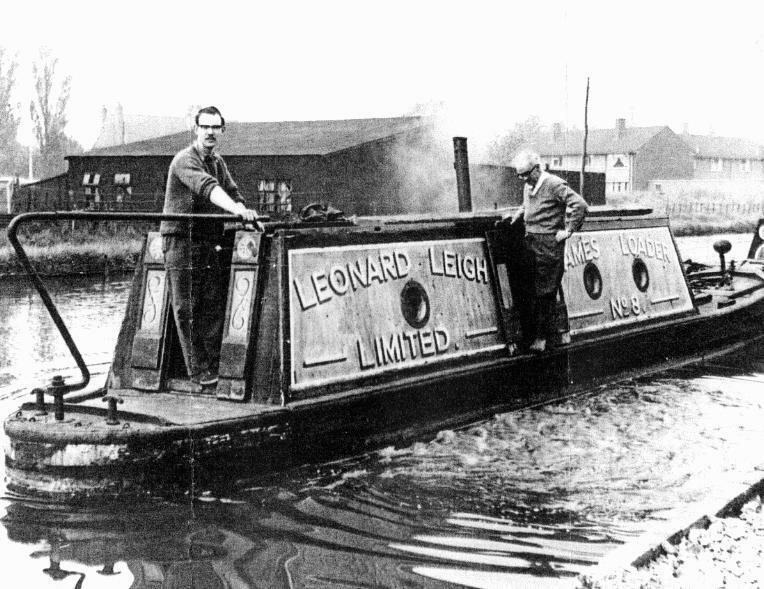 It entered service in 1947, and was named after Leonard Leigh’s son James Loader Leigh. Its dimensions were 41’ by 6’ 10” by 3’ draught. As originally built… in 1946-7. One of two wooden tugs built at the time for the company, the other being the Christopher James, built at Spencer Abbotts dock. Worseys also built the tug Joan II, in wood, for Leigh, she was launched on 16 April 1936. Hull construction is on a flat double planked 4” elm bottom, 2” planks longitudinally on 2” cross planks. 2” by 8” oak side planks held by iron omega cross section knees along the sides, with 8” deep wooden frames to form the shape of the bow. A long bow and counter and an inward curve of the knees to the bilge give a fine shape to the hull, and an easy swim through the water to the vessel. Planks are fixed with cut iron boat nails in the scarf joints and to other timbers, and nails riveted and cropped over roves through the frames and knees. Internal ¾ inch oak shearing is fixed with iron nails with tar paper behind. The original cabin was shorter than the present and had sloping fore and back ends and a level roof, with six marine portholes. A long tiller gave extra leverage for steering when towing. The original engine was a four cylinder Fordson diesel/paraffin marinised tractor engine developing 56hp. The 40’ long tugs had been developed to be able to be turned more easily, and in more places, than full length boat conversions, and being a plank short of a traditional boat, and having flat fore and aft decks, were level with the canal banks for easy and safe access. As a working tug there would have been basic fittings for day use – possibly wooden benches with a bottle stove, with storage forward for ropes, chains, engine spares, fuel, lubricants etc. 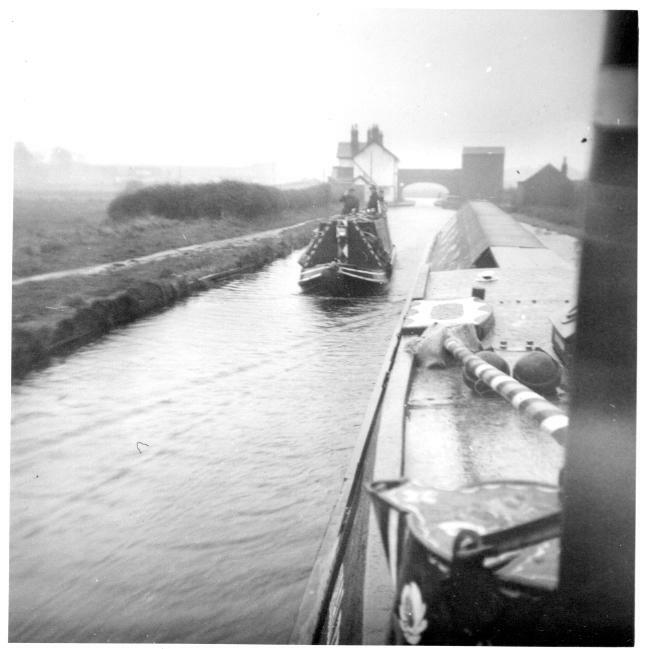 The tugs would not necessarily work through locks – the full boats would be towed, for example, from Anglesey Basin to the top of a flight by one tug, then worked through by hand to be towed onwards by another tug, the tug at the top taking empties back to the collieries. A train of five dayboats or ‘ampton boats could hold over 200 tons, steered by a man on every other boat, attempting to keep warm in winter with a brazier burning scrap wood, envying the tug captain with his hot engine and stove. The wartime Leonard Leigh tug fleet, including Spitfire, Tempest, Hurricane, Typhoon and the wooden Joan II was expanded after the war with James Loader, Christopher James, and Helen. James Loader was fleet No.8. The tug fleet worked on the BCN until the winter of 1962/63, when the Cut froze for weeks and the coal traffic was transferred to road vehicles, never to return. The tugs were laid up at the yards, and offered for sale. James Loader was bought by Peter Freakley in March 1964. Peter Freakley made extensive repairs to the hull, “gunwales, side planks and foredeck all having to be replaced.” A new cabin was built with four berths, a separate engine room, and toilet/wash room. The boatman’s cabin dates from this time, with its dark scumble and rose and castle decoration. One decoration of interest is the map of the BCN showing all canals whether in use or derelict (in 1965) on the wall opposite the cabin range. The tug foredeck was replaced with a well deck with seating behind a cratchboard and short top plank, and the livery was red panels with green framing, with P.J. FREAKLEY BIRMINGHAM proudly lettered on the cabin sides. In August 1968 Freakley bought a derelict wooden Leeds & Liverpool short boat with a Gardner 2LW engine inside. It was the Robert of the Hargreaves fleet, and lying at Tarleton on the Rufford Branch. He removed the engine and towed the short boat out into the River Ribble, where it was burnt on a sandbank. 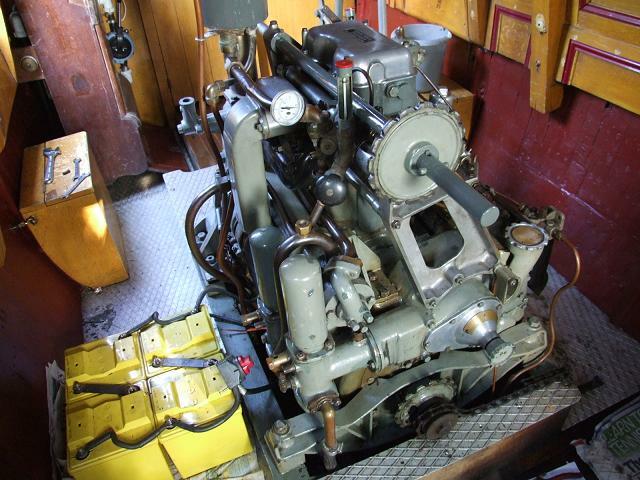 The engine, dating from 1947, was restored and was installed in James Loader with the parts manoeuvred in through the side doors. This engine is still going strong today. Peter Freakley cruised extensively and visited many rallies. From January to July 1972 it was lifted out at Allen’s Oldbury Dock for fitting several new planks in each side of the hull. The livery reverted to Leonard Leigh colours in 1980. The canal water engine cooling was replaced by a closed circuit system running through copper pipes under the starboard counter at this time, as described in the Gardner manual. He had the fore-end top bend planks replaced at Norton Canes in 1983. Peter Freakley sold James Loader to Andy Flack in 1991. Extensive work was carried out in 1993 and also on the hull during the winter of 1993-4 at Stockton dry dock, including replacing waterline hull planks, gunnels and stern deck. The tug deck was reinstated, as a sealed deck of hardwood planks on marine plywood, and the fore end of the cabin redecorated by Ron Hough. The next owner, Ken Cody, moored the tug at Stockton and Newbury, and also cruised the system etensively, with one memorable journey taking them to the River Medway down the Thames tideway. Repairs were carried out to the starboard swim area on the bank at Sharpness shipyard. Peter Boyce, the current owner, bought James Loader in May 2001 and came south to moor at Newbury. A Grand Tour in 2002 took the tug from Newbury via Bristol and the Severn Estuary to Anderton and Northwich, then down the Ship Canal and across the Mersey to Liverpool. The opening of the Ribble Link beckoned, and after pausing on the Lancaster Canal before headed back to Manchester and a passage across the Rochdale to the IWA National at Huddersfield. Returning via the Huddersfield Narrow and the Peak Forest, with a stay on the Llangollen after visiting Whitchurch and Ellesmere rallies. 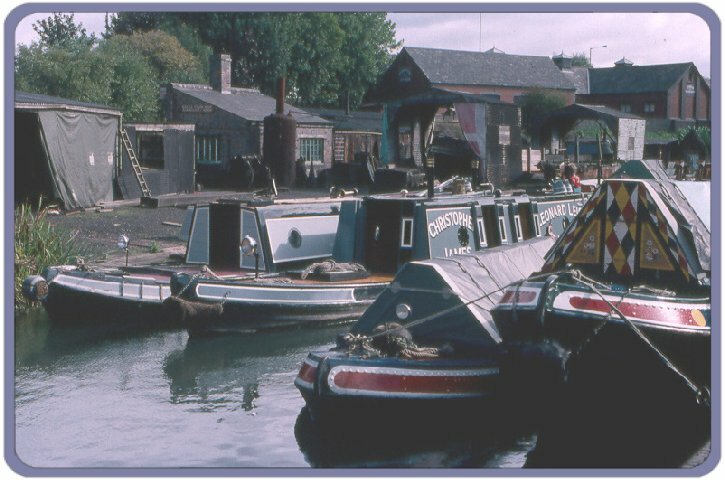 Small hull repairs, painting and hull tarring were carried out in the historic dry dock at Ellesmere late in 2002, then the rest of the winter was spent at Hazlehurst on the Caldon. The butty Betelgeuse was bought the boat in January 2003, and from then on James Loader was effectively towing cargo again. 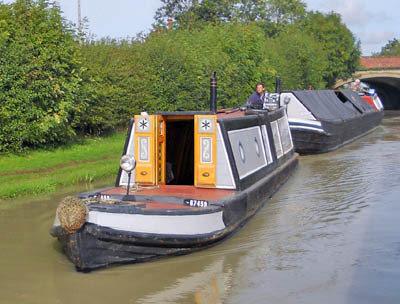 The pair of boats were registered as commercial and single loads of coal were taken from the Grand Union to the K&A in 2004, 2005, and 2006. 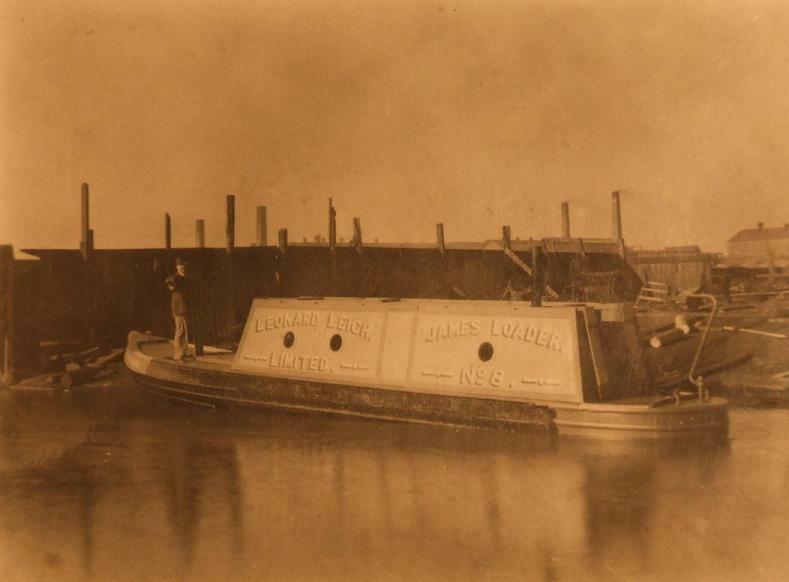 James Loader was also added to the River Thames tug register. Regular dockings kept up with tarring, shoe plate repairs and painting. In 2006 James Loader towed the Meadow art installation from Bath to London with the artist Tania Kovats in residence on the butty. The Thames toll ticket stated “One ton of turf”. 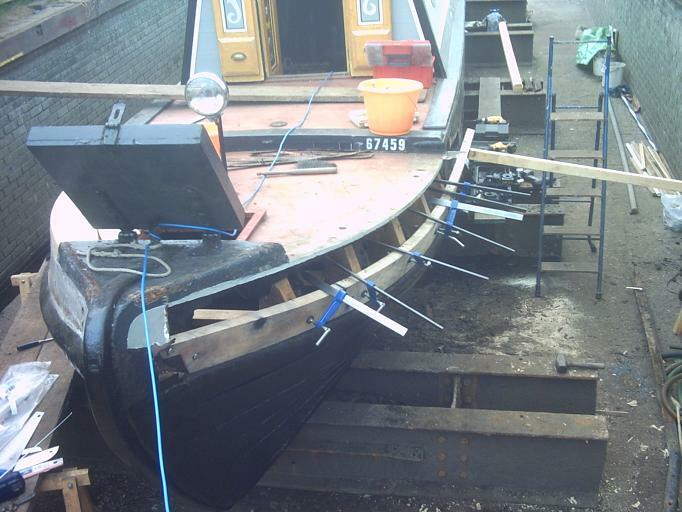 April 2006 saw significant work carried out on James Loader, with both of the top bends and the next plank down on the port bow, replaced as they were completely rotten with wet rot and fungus. 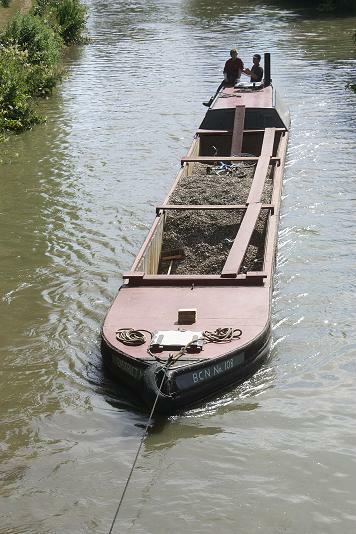 In 2007 James Loader towed Betelgeuse to a new contract on the Denham Sand Traffic with Arundel, while James Loader continued north to collect the day boat Joe from Braunston and deliver it to Lyons Yard at King’s Norton for stretching back to 70ft. At the end of the year James Loader took up moorings at Braunston Turn. 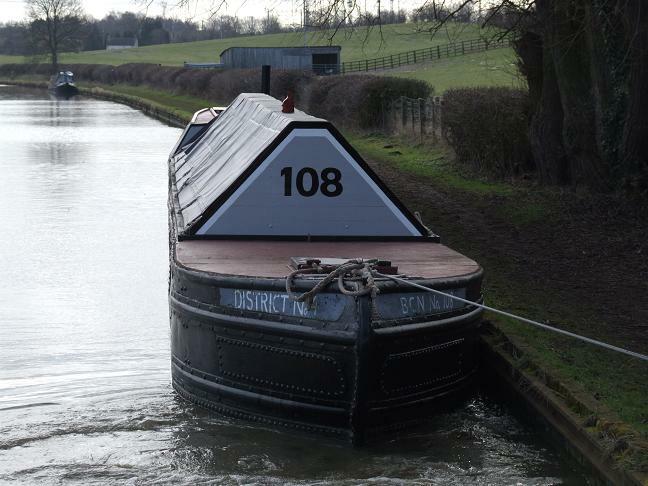 In 2008 James Loader collected BCN No108 (ex ‘Joe’) from Lapworth at the New Year, towing it to Tess Wharf, Braunston, for fitting out for the sand traffic. ‘Joe’ was delivered to Uxbridge after the stoppages were finished, and after attending the Easter gathering of the Historic Narrow Boat Owners Club at Stoke Bruerne. James Loader with Betelgeuse in tow then attended the Rickmansworth Canal Festival, and later, Banbury Canal Day. In November 2008 she towed Betelgeuse to Stockton Dry Dock, carrying timber for the new running gear for the town class motor Stanton. In late 2008, the tug became the working platform for work on the sunken ‘Lucy’, at one time supporting the outer leg of a gantry for lifting the heavier items out of the boat. 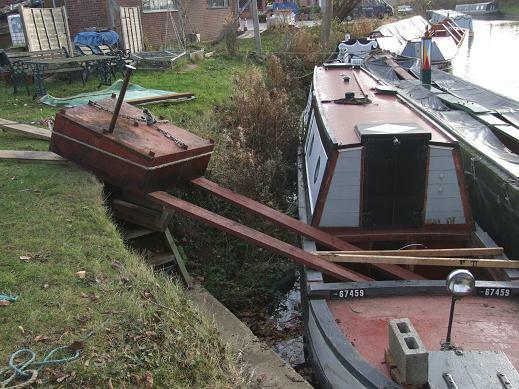 In 2009 James Loader was heavily involved with the recovery of the ‘Lucy’, and in May towed the rescued Lucy from the puddle banks to the marina for lifting on the steel frame. 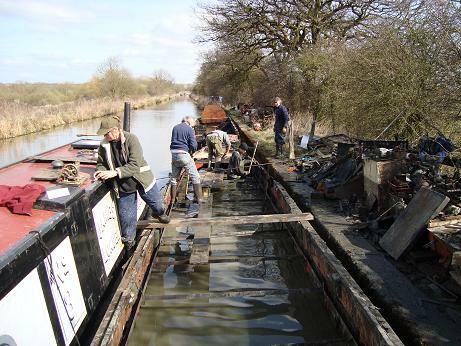 In the June the tug was drydocked at Braunston bottom lock, for hull repairs, painting and tarring. 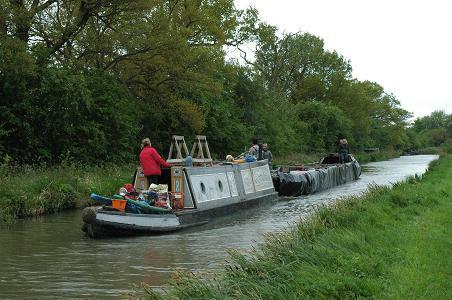 In September he towed Betelgeuse to the River Thames via the southern Oxford Canal, to a towing job on the Basingstoke Canal. The houseboat Dragonfly, a 100+ year old iron BCN day boat sitting in an outer steel hull, needed towing to Pyrford Marina drydock on the River Wey for re-plating. In 2010 James Loader towed Betelgeuse to Coventry for the HNBOC gathering, and attended the tug gathering at the BCLM, Dudley, over the Mayday weekend. 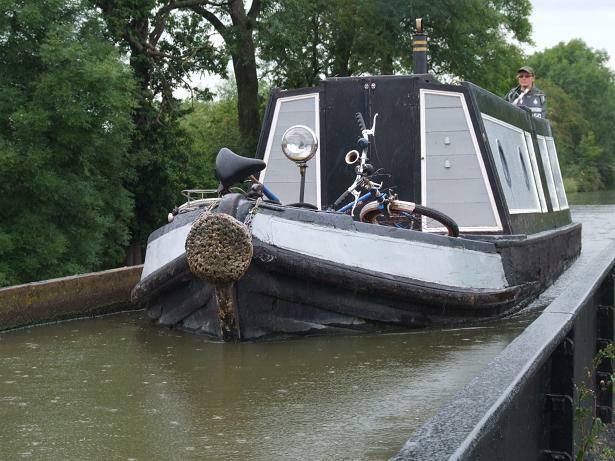 In June Betelgeuse was towed to Stockton carrying materials for the restoration of FMC motor Admiral, and then took the butty to Banbury for the Canal Day in the October. Recollections of a 12/13 year old boy, 1960/61 summer holidays with the James Loader. My Grandmother lived near the canal not far from the railhead Hollybank. 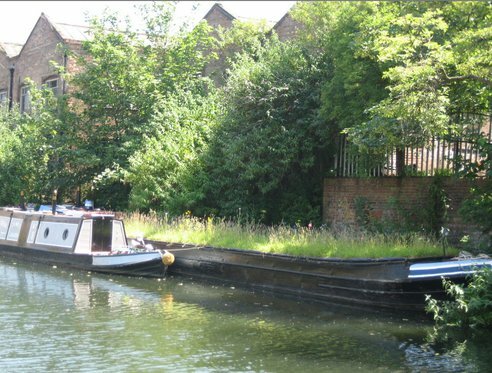 I cycled along the canal frequently and saw the James Loader, Christopher James which always pulled 4 coal boats and the Enterprise which pulled 5. The latter always looked rear heavy compared with the shorter JL and CJ and on the odd occasion it was travelling without boats the first foot of the bow was slightly out of the water. I would ask if l could have a ride and at first they refused but one day one of the coal boat men pulled by the James Loader agreed. I cycled to the next bridge and waited, then with cycle around my neck I jumped onto the moving boat landing in the black dirty coal slack. l would do this most days and after a while they would let you have the tiller while they slept in the cabin appearing when we came to awkward bends to make sure you didn’t get “stemmed up” on shallow parts that were not trafficked. When they changed boats the would carry a very hot stove with detachable stack to they new boat., these daffodil bulb shaped stoves would keep the stark dark cabins quite warm in what was otherwise a grim environment. One day the driver of the tug, who had a regular boy helper who was away beckoned me on the James Loader. Off memory there was two compartments a cabin consisting of two long benches, a stove and little else but with the portholes it was much better than the coal boats and an engine room with spare ropes fuel cans grease etc. Like the others he soon let me have the controls and would only take over on the bad bends. Driving the tug with boats was different, empty boats, close tied, were easy as the followed the tugs line although on windy days the boats could get blow into shallow areas and get “stemmed up” it was then you saw the skill of the men with the boat hooks. Pulling loaded boats was altogether different. On the straight it was easy but on even shallow bends the coal boats steered the tug. So you took the bends wide knowing the trailing boats would pull you to the centre of the canal by the time you rounded the bend. It was only when you had mastered this that l was allowed to do this unsupervised. Between Hollybank and Hampton Light was the Wednesfield Turn, at least that’s what they called it. One day whilst approaching this bend l was late getting over and was taking a central line. I quickly found myself tight to the towpath on the wrong side of the bend. The driver appeared quickly and took control but some thing was wrong, the propeller was fouled. The coal boats were unhooked and the tug was manually pulled buy the driver to the locks of a branch canal near Heathtown, l have forgotten the name of the canal. The tug was put in the top pound which was then emptied. A discarded tyre was the culprit which when cut off fortunately it had not done any further damage. 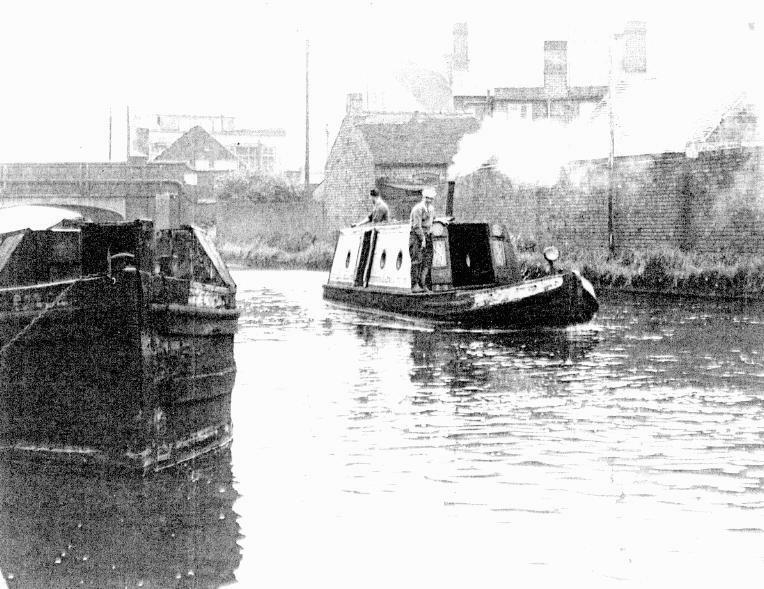 By the time the tug was back on the main canal ready to work the coal boats were all there having been pulled a substantial distance with 28 tons of coal by their operatives. A Supervisor in the meantime had arrived from Wolverhampton to find out about the delay although l think he was given a laundered version of events as nothing happened. Apart from the odd trip this came to an end for me as the Autumn school term started but l have lots of memories including watching the icebreakers in the winter of 62/63 but that’s another story. Thank you for sharing such a wonderfully atmospheric memory of a world that was to disappear so soon after your adventures on tug and tow. I’d have loved to have seen the BCN in action, the bustling yards and wharves served by countless short-haul, day boats. 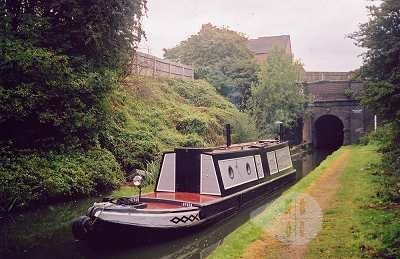 Our own boat Eileen, built at Iron Boat Dock Tipton, spent most of her working life as an open single-ended day boat around the Alfred Hickman’s Spring Vale steel works at Bilston. I’m still hoping to find out more of her history on the BCN in the first quarter of the twentieth century. Since posting the above it has given rise to further memories which I thought might be of interest to some. Firstly I would love to say I remembered your boat Eileen but alas no, but I am sure someone out there will. I thought it may be of interest to record a typical day for the James Loader not long before the coal boat operations ceased completely. James Loader always spent the night in Wolverhampton and it’s first trip was empties to Holly Bank near Short Heath. Holly Bank was the end of a single track railway that brought coal slack from the Pit, I think Hilton Main, through Essington and New Invention. There was a loading crane and office of which I remember little and a basin where the boats were loaded. I do remember there was an old spaniel dog which belonged to the office clerk which on hot days would jump in to the water to cool off, he was too old to pull himself out and would usually go cross eyed with the effort until some helped him out. The James loader’s boatmen would start early and the arrive at Holly Bank I guess around 7.30am where loaded boats were waiting. The usual swapping of fires and personal belongings took place and I think I a right in saying the rudders and tillers. I am sure they pulled the heavy rudders floating in the water and lifted them onto hooks on the new boat and then attached the detachable tiller. My memory is a bit sketchy regarding this so I hope I have it right. Four loaded boats would then be taken to either Hampton or Walsall light dependant on demand. Around halfway the boats went through a load checking area comprising of a narrow section of canal like under a bridge but longer where a clerk came out of an office. He had a long piece of wood with a right angled cross section that fit on the top of the gunnel of the loaded boat. The top half was a handle and the bottom half was calibrated and gave a tonnage reading according to how low the boat was in the water. It was fairly equidistant to either power station and they would return back with empties around midday. The second loaded trip was normally Walsall with the final trip always being back to Wolverhampton. As you are aware the winter 62 /63 and the six week freeze stopped coal boat deliveries during this period which spelled the end for these operations. I have a good recollection of the ice breaker team working a half mile or so from Walsall power station allowing the first loads of coal to get through. Again this may be of interest so I will put this on another day. Thanks again Derek, it’s a pleasure to read your reminiscences, bringing the quiet waters of the BCN back to life for those of us who weren’t fortunate enough to be there at the time.